I just finished writing an article yesterday on my hacker not cracker blog about the mysterious yet ubiquitous Wake on LAN function featured in many motherboards and network interface cards. In it, I mentioned the basics of creating a “magic packet.” As I pointed out, a magic packet is data consisting of “FF FF FF FF FF FF” followed by 16 repetitions of the listening network device’s MAC address. I also revealed that I use a PHP script to facilitate in generating that packet. Before I modified the PHP script, I used a simple little freeware program released by Depicus. The Depicus website provides a similar background on WOL and magic packet generating tools supported by a wide variety of platforms and implementations. If you’re interested in using Wake-on-LAN, Depicus is another great starting point for tools necessary to get the most out of your setup. This entry was posted on Thursday, April 20th, 2006 at 5:30 pm	and is filed under Internet, Utilities. You can follow any responses to this entry through the RSS 2.0 feed. You can leave a response, or trackback from your own site. Fantastic little program, works perfect! Continue using your external IP address. In your router, forward all packets on port 7 and 9 to your home network’s broadcast address. If your home network’s IP address structure is 192.168.0.x or 192.168.2.x, then your broadcast address would be 192.168.0.255 or 192.168.2.255 respectively. I do not have a domain, so what should I put in the Internet Address box? I tried putting in my external IP, but that did not work. 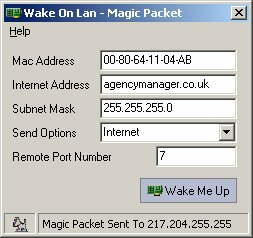 Can anyone tell me how I can wake over the internet? I cannot figure out everything I need to enter in, to where, and what settings I may need to change in my router. No problem. Yeah, I still try to keep up with this blog and my other 4 but I’ve been really busy. Anytime someone posts a comment, I still get email notifications. Wow, I can’t believe it has been 3 years! On your question, I think this article I wrote says stuff about how to forward (http://www.hackernotcracker.com/2006-03/port-opening-and-forwarding-on-windows-xp.html). If you still can’t get it, post the make and model of your router. Thanks Allen. When I tell my router to forward port 7 to 192.168.1.255, it errors “value is out of range. 0-254″ Why is the highest number 1 below 255?